Welcome to the second blog post of our One Good Thing series! In a week of stressful news, we are excited to share more recent successes from our members. This week we are featuring some recent success happening at Finger Lakes ReUse. 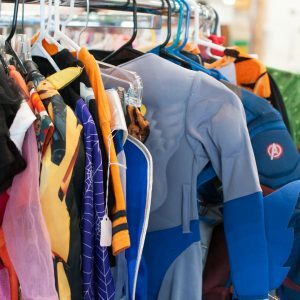 Donation areas are always challenging to manage, and for FLR it has been especially challenging as they’ve seen a 60% increase in donations in the past year. One of their biggest challenges around strong donation growth is the amount of resources used in storing materials. They currently have limited storage options. They also face the issue of absorbing higher than expected donations – this can lead to an inefficient and overcrowded processing area. To remedy this problem, FLR plans to relocate their donation intake area to a larger separate building on their site. While a large increase in donations could be potentially stressful at times, this is a good problem to have because more donations leads to more revenue – which is up by 31% over the previous year! We’ve always tried to make our donation process as convenient as possible. We’re open 7 days a week and we do free pickups in our county. Our second location, which we opened at the end of 2015, is in a much more centrally located and a more convenient location than our original ReUse Center. 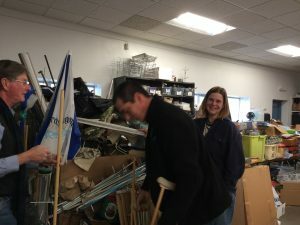 After we opened the second ReUse Center, we began transitioning into turning our donation area into a One-Stop-Drop-Off for all things reusable. We started accepting clothing and other textiles with the assistance from the Cascade Alliance. FLR made recent changes to help make sorting and stocking easier. A hole was cut into a wall at their old space to make the store more shoppable. Clothing sales have also increased and their clothing department is expanding. The increase in donations in conjunction with the ever-expanding sections will keep the momentum up. Congratulations on your recent successes! We look forward to sharing more of your stories.